If you love to ride the trails and you know how to do it safely, you could be the right fit for the DNR’s ORV safety education program. The DNR is recruiting instructors for this volunteer opportunity that lets ORV enthusiasts share their love and knowledge of the sport with new riders, while emphasizing safe, responsible ORV operation for a great experience. 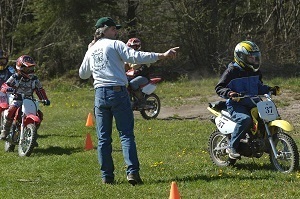 All volunteer ORV instructors must attend a three-day academy – all expenses paid – to learn policy and procedure, classroom management and teaching concepts. 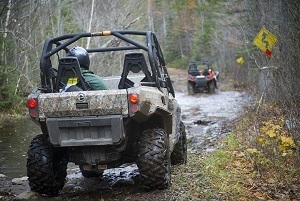 Attendees will explore many aspects of ORV operation, including basic hands-on skills on off-highway motorcycles, all-terrain vehicles, utility-type vehicles and winching recovery equipment. Active instructors also are invited to brush up on knowledge and skills and experience changes in equipment. Friday-Sunday, May 3-5, Roscommon, at the Ralph A. MacMullan Conference Center. Friday-Sunday, June 7-9, Escanaba, at the state fairgrounds. Be a high school graduate or have a GED. Have no misdemeanor convictions within the past three years. Maintain a high moral, ethical and mental character. To receive an application, call Erica Moore, 517-284-5991. After a completed application is submitted, a background check will be conducted. Successful applicants then will be contacted to schedule their attendance at one of the ORV instructor academies. Questions? Contact Cpl. John Morey, 989-619-3784. Calling all young artists: The U.S. Fish and Wildlife Service is accepting entries for the 2019 Michigan Junior Duck Stamp Contest administered by the Shiawassee National Wildlife Refuge in Saginaw. Entries must be postmarked by March 15. The USFWS has hosted the contest in Michigan since 1995 to boost education and awareness about North America’s waterfowl and wetland resources. 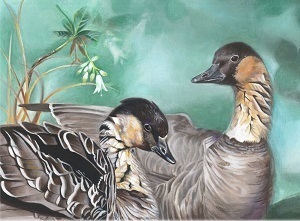 In 2018, Alice Ying of Novi won the contest with her acrylic drawing of nene (Hawaiian) geese. Entries will be judged in four groups, according to grade level: K-3, 4-6, 7-9 and 10-12. Submitted artwork can feature one of the following species: whistling ducks, swans, geese, brants, dabbling ducks, diving ducks, sea ducks, mergansers, stiff tails or Hawaiian ducks. Judging will be open to the public this spring at Green Point Environmental Learning Center in Saginaw. Entries will be judged on original design, anatomical accuracy, artistic composition and suitability for reproduction on a 1-inch by 1.5-inch stamp. In addition to first-, second- and third-place entries, contest judges will select a “Best of Show” entry that will be submitted to the Federal Duck Stamp Office and entered into the National Junior Duck Stamp Contest. The first-place art from the national contest is used to create a national junior duck stamp each year. The junior stamp is available for $5 from the U.S. Postal Service and from many national wildlife refuges. Proceeds from stamp sales support conservation education and provide awards and scholarships for participating students, teachers and schools. A downloadable entry form, a list of permitted species and full information on contest rules and regulations for teachers and supervising adults are available at FWS.gov/JuniorDuck. Questions? Contact Holly Vaughn, 313-396-6863. Wondering where the walleyes are? Sizing up salmon this season? Looking to lock down the ins and outs of local regulations? If you’re interested in talking with DNR fisheries staff about local and statewide issues important to you and your community, stop by one of the upcoming “Conversations & Coffee” events around the state this month and next. 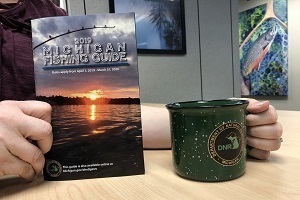 The DNR has hosted those outings the past several years to give people an opportunity to meet with Fisheries Division managers and biologists, discuss local issues and management activities and get answers to specific questions. To encourage conversation, the meetings are very informal; at many, no formal presentations are planned. Refreshments will be provided. These forums also are great opportunities to catch up on local and statewide fishing regulation changes that affect anglers. For more detailed information about the meetings or other questions, visit Michigan.gov/Fishing or contact Elyse Walter, 517-284-5839. 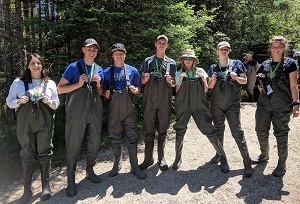 Students ready for an intensive, inspiring four days immersed in natural resources learning are encouraged to submit their applications for this year’s Career Pathways Program, June 23-27 at the Ralph A. MacMullan Conference Center on beautiful Higgins Lake in Roscommon County. Program highlights include hands-on field experiences with wildlife and fish biologists, foresters, park rangers and conservation officers. Research shows the value of the “resident experience” in terms of learning and retention, so Career Pathways participants spend their five days and four nights at the northern Michigan conference center. Aside from field work with DNR professionals, students also get the opportunity to meet representatives from Michigan colleges and get tips on résumé building and interviewing for jobs. Applications are due March 15 and selections will be made by May 1. More information and a downloadable application are available at the Career Pathways webpage. Questions? Contact Kevin Frailey at fraileyk@michigan.gov or Bruce Ross at brucej.ross@yahoo.com. Winter conditions – very cold temperatures and heavy snow over ice, for example – can kill fish and other aquatic creatures like turtles, frogs, toads and crayfish. When ice and snow start to melt in the spring, it’s likely that people will begin to discover those deaths. "Winterkill is the most common type of fish kill," said Gary Whelan, the DNR Fisheries Division’s research manager. "As the season changes, it can be common in shallow lakes, ponds, streams and canals. These kills are localized and typically don’t affect the overall health of fish populations or fishing quality." Shallow lakes with excess vegetation and soft bottoms are prone to winterkill. When aquatic vegetation under ice and snow dies from lack of sunlight, it uses up dissolved oxygen as it decays, and that creates fish kill conditions. Canals in urban areas also are susceptible due to run-off and pollution from roads and lawns and septic systems, again using up dissolved oxygen through the decay of vegetation and organic materials in sediments. Fish can get easily stressed as they often have low energy reserves in late winter and food is scarce. That equals less adaptability to low oxygen and temperature swings. Anyone spotting a fish kill in larger quantities – 25 fish or more – should report it using the Sick or Dead Aquatic Species form available under the fish icon at Michigan.gov/EyesInTheField. People also can contact local DNR offices. It’s important to report observations as soon as possible, allowing fisheries staff to collect the best-quality fish for analysis. 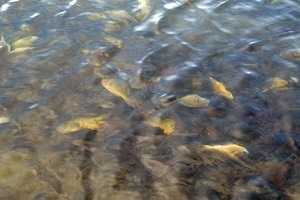 For more information, visit Michigan.gov/FishHealth or contact Gary Whelan, 517-284-5840 or Elyse Walter, 517-284-5839. Out-of-state residents can save money and take advantage of great outdoor opportunities with the 2019 Hunt/Fish Combo package! Buy online or wherever licenses are sold. Grant-in-aid partners are reminded of the approaching deadline to apply for approximately $1.75 million in Waterways Program grants. Applications due April 1 by 5 p.m.
Best way to stay on top of how severe and changing weather affects trails and other outdoor recreation resources? Frequently visit our DNR closures webpage to see what's happening locally.